As travel writers and bloggers our task is to make a travel story about our destination. Part of our job is educating our readers so they can decide whether they’d like to visit a place or not. But reciting raw information is missing the real point of travel writing. It doesn't tell a story or engage the reader. How many mind numbing bullet point lists have you seen recently? “The Top Ten Things To See in Budapest”, “48 Hours In Tokyo” and “Five Things to Do At JFK Airport”. These lists are everywhere! And they don’t make for enjoyable reading. Good travel writers encapsulate the facts in vivid story form. 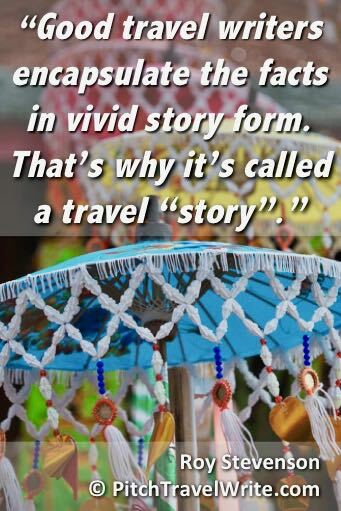 That's why it's called a travel "story". It’s easy to take shortcuts by throwing together quick lists and calling them travel stories. Beginning writers eager to establish some bylines and build their writing credibility sometimes fall for this trap. But don’t go down that path, no matter how tempting. Remember, sub-standard, amateurishly written articles will haunt you for as long as the article is posted online. Today, print magazine editors go online to check out your credentials and writing. They won’t take you seriously if the only thing you can show them is an online portfolio of amateurish travel lists. Enough with the facts and figures and bullet point lists of the place’s top attractions! These things have led to the dumbing down of creative travel writing and blogging. Remember, if your readers want facts and figures about a place, they can easily find them on the Internet. Readers want to be entertained. Whether they’re reading a print article or a blog, they expect you to transport them to a destination – and make it an enjoyable ride. It’s up to you to write a travel story that awakens their senses to the scent of Frangipani wafting through the air. They want to taste the rich, spicy curries and the ripe mango bathed in that white, oh-so-sweet coconut milk. They want to feel the sand beneath their feet, the warm sun on their skin and the gentle breeze blowing over them. And if they’re reading a story about a hiking adventure, they want to imagine how good it feels when the icy cold water from the waterfall splashes off their backs. Our readers want to experience the place and meet the locals – and be planted smack dab in the middle of the action and feel of the place. 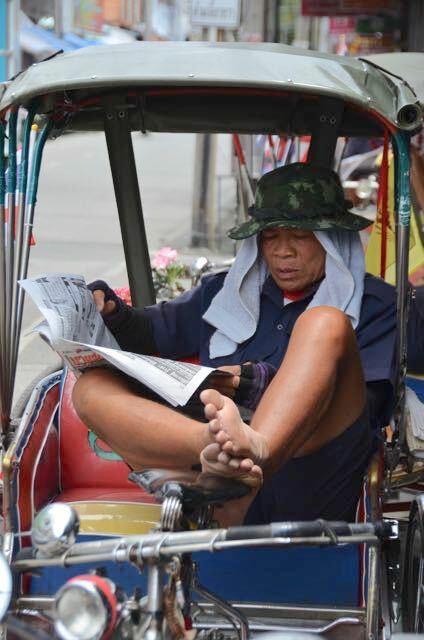 Tuk tuk driver relaxes and reads news stories in Chiang Mai, Thailand. No one enjoys travel stories that read like fact sheets or destination marketing brochures or website advertorials. If you write for print, editors expect you to deliver a travel story, not a Wikipedia summary. And readers of travel blogs will visit and return to your sites if your stories are stimulating and entertaining. But how can you transform all those facts and figures you've collected into readable and interesting travel stories? 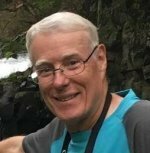 Guidebooks certainly have their place in travel writing because they summarize the destination’s main attractions, along with where to stay and where to eat plus other useful information. I use guidebooks all the time as a reference. 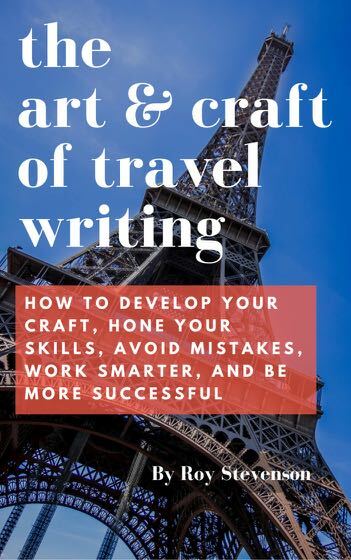 But, guidebook writing is not creative, nor is it meant to be. Its purpose is education and facts. Read through a random chapter in a guidebook and you’ll notice how stilted the descriptions are. When you write a travel story, your work is not just presenting information and statistics about the destination. 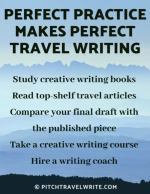 Good travel writing makes us want to pack our bags and jump on the next plane out. Poor travel writing makes us throw away the magazine and look for something more interesting to read. Telling a story makes your article easier to read, and far more captivating. You’re painting a picture of a place rather than boring us with bland statistics and lists. Your articles should sound like you're talking casually to a friend over a cup of coffee. We all love stories so tell your story to the readers. It’s okay to mention facts and figures conversationally to support your story, but the story is the main event. Before you submit your article to an editor or post it to your blog, make sure you’re telling a story. Subtly include facts and figures to support your story, but don’t make them the main event. Leave that to the guidebook writers. A great way to test out how your travel story “sounds” is to read it out loud. Does it sound like the way you normally talk to people? But don’t make all the sentences short – that makes your travel story sound choppy. Vary your sentence length. Make some of your sentences short and some longer – mix it up and give your readers some variety. Keep reading aloud and rewriting your article until it sounds conversational and natural. Make it sound like you're talking to a friend. Your readers don’t want to work hard to get through your travel story. Articles that are primarily facts and figures make your readers work too hard. How do you feel when confronted with a list of raw data? You tend to switch off and stop reading. Lists of facts and figures aren’t going to take your readers to the place, but good creative writing will. People prefer to read about travel for entertainment and escapism. Many of our readers are armchair travelers. Since they’re just reading for fun and traveling vicariously through your story, make it easy for them. And write to a 7th grade level, or lower. Research shows that people reading for enjoyment prefer to read a couple of grades lower than their capabilities. If you write above a 7th or 8th grade level they’ll struggle more with the story and will drift away. Here's an article about readability and how to know what grade level you write at. If you’re writing a historical piece about a place where something dramatic happened, write your travel story as if you’re telling it to a group of kids over a campfire. Be dramatic and use dynamic words. Remember, your goal is to make your article read less like a history textbook and more like an adventure story. Bring the scene to life and embellish the story. 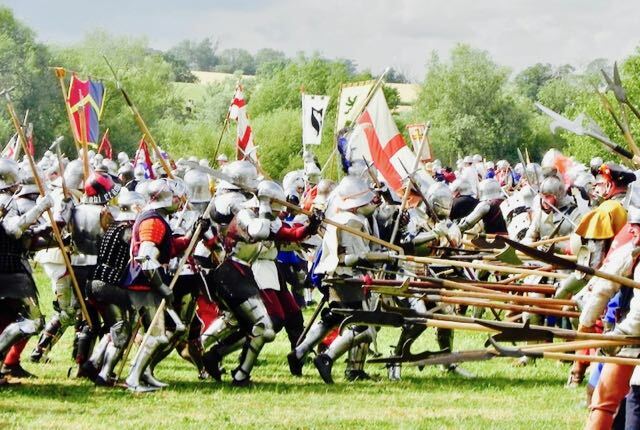 Which of these paragraphs grips you the most about watching a re-enactment of the Battle of Tewkesbury? The first paragraph flops around like a dying fish. It just states the facts and it’s passive. It blandly tells you where I am and what I’m doing. Ho hum. The second paragraph is exciting and descriptive, and hurls the reader into the event. You want to hurl the reader into whatever place or event you’re writing about. It's important to make the reader feel like they're actually there watching the re-enactment of the Battle of Tewkesbury. How you tell the story matters. This is an exaggeration, but I think you get the idea. Your readers want to know what the place was like, but they want to be able to imagine themselves right alongside you. They can’t get this from a personal blow-by-blow diary-type description. If you want to write your travel story in the first person (using “I”, “me”) know that there’s an art to it. Good writers manage to subtly inject their feelings and emotions without getting in the way of the story. If you’ve toured the Roman Coliseum, did you feel deeply impressed with the history of the place? I certainly did. But, how can I convey this feeling to my readers? “I was deeply impressed with the Roman Coliseum” doesn’t help the reader feel anything, even though it accurately conveys my thought about how impressive it was. All three of the above sentences say “I was impressed”. But only the second and third examples give the reader a chance to inject his own imagination about the past, based on your words. These two sentences convey my feelings and let the reader imagine his own feelings. It provides common ground, an experience we can share. It takes work and well-developed creative writing skills to give a good first person account of a place. As writers we’re continuously developing these skills so if you haven’t developed these skills, take a creative writing class and get some practice and feedback. We all use destination websites and brochures to help us write our travel stories. And that’s fine. You need the information from destination media to make sure you have correct names, places and facts. But use it judiciously. Do not lift entire phrases from websites and brochures. This makes your travel story read like an advertorial or promotional sales brochure – because it was copied. And it’s plagiarism. You’re a writer. Write your own words, inject your feelings, and tell it in your own voice. It takes time to develop your own voice, but if you practice with every article you write it will eventually happen. There are an infinite number of ways to improve your travel stories and the tips in this article are just a beginning. I challenge you to make these things an integral part of every travel story you write. 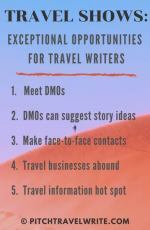 Your articles will be more enticing to editors and to readers of your travel blog. There are many examples of good travel writing out there. Study how other people do it to help you develop your own voice. In my first year of freelance writing I wrote a travel story about an historical place, the Pere Lechaise cemetery in Paris. There were lots of historical facts and figures and you can see how I managed to weave these into the bigger story, An Artist’s Nirvana. Here’s family travel blog I happened to find the other day. This article is about Singapore, one of my favorite places to visit. The title 8 Things to Do in Singapore With Kids + Where to Eat & Sleep makes you think it might be a list with boring details (oh, no!) - but it's not. It will give you some good ideas about how to turn a list into enjoyable, informative and fun reading.